Two fun holiday movies in one great combo pack! Bring home some Holiday cheer with Disney's Prep & Landing and Disney's Prep & Landing Naughty vs. Nice Totally Tinsel Collection Blu-ray Combo Pack today. There is just something about those cute little elf's that will warm your heart and get the whole family laughing each and every time! 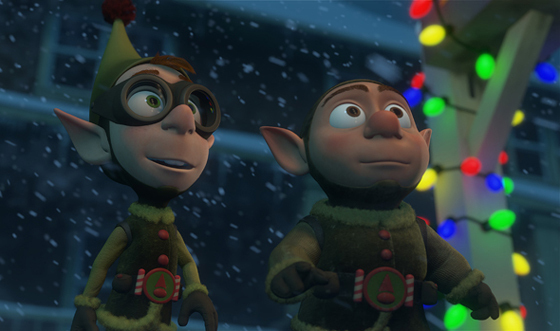 Watch as this energetic and highly devoted team of elves secure the houses around the world in preparation for Santa's big landing; with the highly anticipated presents of course! The "Totally Tinsel Collection" also includes some fun bonus features that the entire family will love! Bonus features include: two animated shorts, “Operation Secret Santa” and “Tiny's Big Adventure;” North Pole Commercials; Kringle Academy; North Pole News; Behind the Scenes with Grace Potter, and much more! “Prep & Landing” - On Christmas Eve, a high-tech team of elves from an elite unit known as ‘Prep & Landing’ ensures homes around the world are prepared for Santa’s visit. But when two hilarious little elves face unexpected challenges and are pushed to their limits, it’ll take a great big effort to save the season. Enjoy a heartwarming holiday classic sure to make everyone’s Christmas list! The outrageous yuletide adventures of Christmas elves Lanny and Wayne continue in this totally tinsel adventure that reminds us there’s room for everyone on the ‘nice’ list. Santa’s stealthiest little elves must race to recover classified North Pole technology, which has fallen into the hands of a computer-hacking naughty kid, in an effort to stop Christmas from descending into chaos. Bring the family together for a comical adventure that puts the Ho, Ho, Ho in your Holidays! Disney's Prep & Landing + Prep & Landing Naughty VS. Nice would make the perfect picks for your next family movie night! You can find Disney's Prep & Landing + Prep & Landing Naughty VS. Nice Totally Tinsel Collection at retailers nationwide.